Boy, is it hot outside. I know you might not want to turn on the oven with it blazing hot outside and all. But, sometimes, you just can`t help it. Sometimes, you just need something to eat! So, today I am sharing with you this super simple treat that you can make quickly and then lounge around the house while snacking on these for the rest of the day. Now, doesn`t sound that awesome? 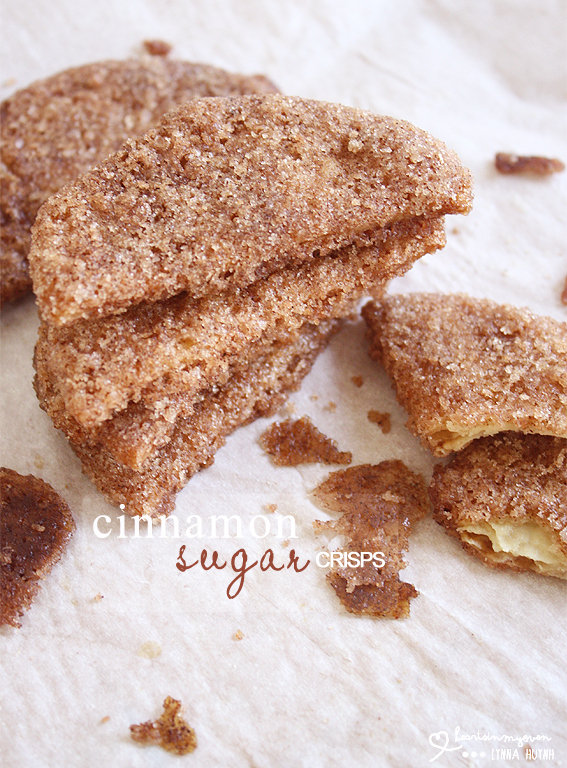 These cinnamon sugar crisps are so simple and they taste so GREAT! It`s like cinnamon chips! And, I love love love chips. So you can imagine how thrilled I was when I first took a bite of these. Even my mom, who doesn`t even eat sweets, LOVED these. They`re actually one of her favorite things that I`ve ever baked. And...I`ve baked a lot of things. It`s kind of sad. I put so much effort onto other baked goods but, this simple thing makes her top favorites list? Oh wells. At least we can agree that these are good. But yeah, simple and delicious. Two words I love together. I`m sure you guys have heard of Abigail Johnson Dodge`s Desserts 4 Today. If not, it`s a cookbook full of recipes that you can make with just FOUR ingredients. Amazing, right? These desserts do not fall short of being delicious, just because they include so little ingredients. These "simple" desserts can look like they`ve been catered! So, if you don`t have the book yet, you should totally check it out. No, I do not make money from advertising these things, in case you`re all wondering. I am still a poor college student. LOL. Her original recipe made disks. Since I do not own a round cookie cutter...I just used a bowl to make the cut outs. Then I sliced the circles in half. For some, I even used a heart shape cutter. For a few pieces, I even rolled them up, to see how they`ll turn out. All the shapes turned out well! 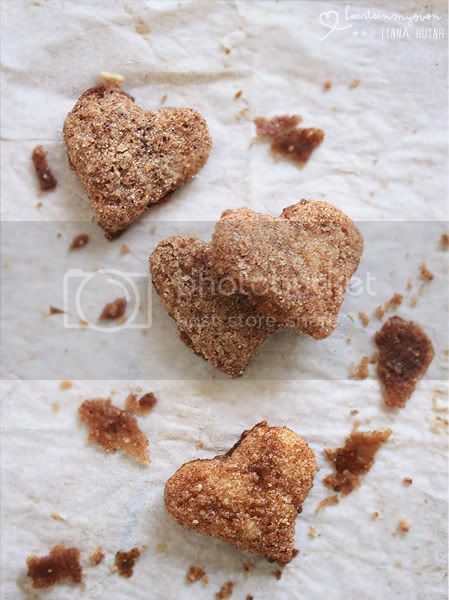 As you can see from the 3rd picture, the sugar mixture does spread while baking. Don`t worry! Just break them off when the cookies have cooled for a few minutes, before moving them onto a cooling rack. Eat them until you`re satisfied! Share them with family and friends! Or, just eat them by yourself! Dodge wrote in the book that it`ll last for 2 days when stored at room temperature. I stored them in an airtight container for a little longer than that and they were still good to eat! 3. 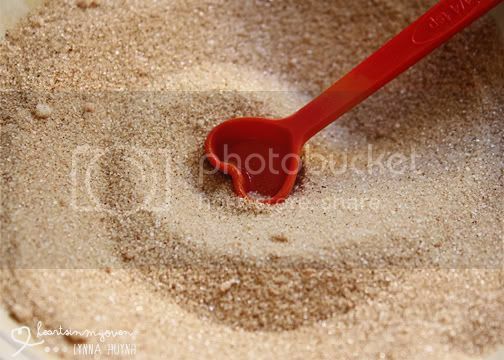 In the other small bowl, combine the sugar, cinnamon and nutmeg with the whisk or fork until well blended. Set aside. 4. Using a rolling pin, unroll the pie dough (if you haven’t already) to make roughly a 12 inch circle. 5. Using the cookie cutter, cut out desired shapes. (I cut them into circles and then cut them in half to make semi-circles, so they’ll be cuter and easier to eat.) Make sure you reroll the scraps of pie dough until you’ve used it all up. 6. Dip the cut-outs into the bowl of melted butter, making sure you let the excess drip off. 7. 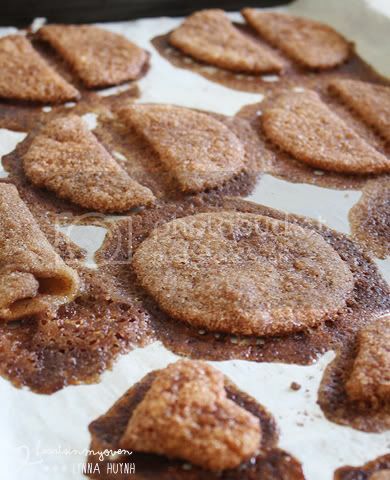 Then, dip the cut-outs into the cinnamon sugar mixture on both sides. 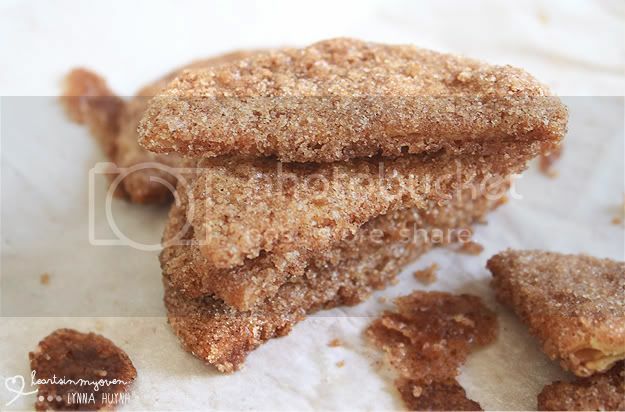 You may also pat it gently to make sure all areas are covered with the cinnamon sugar mixture. It can get a little messy. 8. Lay the pieces on the baking sheet with ½ inch space in between. 9. Bake for about 12 minutes, or until puffed and golden brown. The cinnamon mixture will spread while baking, you can just break the sugar pieces off for a prettier presentation. 10. Remove from oven and cool on cooling rack. Aww! I love the heart ones! These look so awesome!! And fun!! I agree with Cathleen; I especially love the heart ones. I loved the heart ones as well! :) SO cute! Thank you so much! It`s an honor, coming from you!! OMG these are adorable!!! And they look so delicious! Thank youuu so much! Makes me happy that an actress has commented on my blog! They were!! I ate them like chips. I can see why your mom loves these so much! They do look so good! Like you said on my blog, I, too, can almost smell these little chips. I love the smell of cinnamon when it's baked. These look great! Simple and yummy!